She didn’t really mean it, of course. Within 24 hours her campaign issued a clarification explaining that in general Clinton favors higher wages for low-income workers, but she does not specifically endorse the demand for a $15 hourly minimum. So, union members and activists heard their hoped-for message; big business and Democratic Party officials heard the more honest message. Sanders certainly intends to become the voice of “oppositional criticism” in the 2016 election. Thus far, the efforts of this sometime “socialist,” the independent in the Senate who typically votes with the Democrats, have been more successful than those of former Democratic governors Martin O’Malley of Maryland and Lincoln Chafee of Rhode Island. Sanders has been drawing increasingly large crowds in the primary states for his campaign events, and in those states his poll levels are sharply rising. Clearly, Sanders is saying something different—which energizes Democratic and independent voters. The promise of radical change resonates with many whose lives have seen little benefit during the tepid years of the Obama administration. At this stage in the primaries, the Sanders platform gives a public hearing to many progressive ideas. Most notably, the Sanders campaign directs a spotlight on the obscene levels of income inequality in America. Sanders speaks out for a national, single-payer health care system and pledges to pursue efforts to create sustainable energy to reduce global warming. He would remove tuition fees from state colleges and universities. He supports the $15 minimum wage, argues for breaking up the mega-banks, and promotes a jobs package that would put people to work by rebuilding the highways and bridges that are deteriorating throughout America. These are reforms that, if enacted, would benefit the lives of millions. No wonder Sanders’ poll numbers have risen dramatically. Still, Bernie Sanders is hardly an unknown. Given his “socialist-light” political history and voting record, which is virtually indistinguishable from that of a typical liberal Democrat and includes support to funding Israel and the war in Afghanistan, it is fair to ask: Is Sanders really the voice of dissent? Is he really the figure who can galvanize the poor, the working class, women, racial minorities, and youth to lead the political fightback that is so sorely needed? Though audiences at rallies may be stirred by soaring speeches, high-flown words accomplish little. What’s more, a geyser of popular rhetoric tends to erupt every four years around election time. This observation was made 25 years ago. The article, written by Hayden Perry, was entitled: “Congress approves new budget: Higher taxes and fewer services,” which certainly has a present-day ring to it. 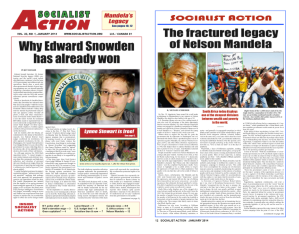 Though it was published in the November 1990 issue of Socialist Action, it could be reprinted today with little change. Bernie Sanders is this year’s model of the token “leftist” who will make oppositional criticism as a safety valve for mass dissatisfaction. His commitment to his causes appears real enough, but it goes no further than the margins of the Democratic Party. Those margins cannot and have never sustained a popular movement that would give real meaning to democracy. How did Bernie Sanders, the socialist who asks if we are ready for revolution, respond to the Nader campaign? In his political memoir, Nader explains: “Bernie had told me that while he sympathized and agreed with our pro-democracy agenda, he could not come out officially for us. The reason was that his modus vivendi with the House Democrats would be ruptured and he would lose much of his influence, including a possible subcommittee chair” (“Crashing the Party,” pp. 125-126). Nader was discreet enough not to inquire about the actual results of Sanders’ supposed influence. It is not a very good deal, but it is the only one on offer, and though Sanders will haggle, pushing for more debates, he will accept what he is given. It’s what Bernie does. In fact, Sanders has built a career as the fighting socialist who takes a dive for the Democrats. Sanders does not lead and does not intend to. He follows. His vision of the future is restricted to what has been made popular in the recent past. The ideas Sanders offers, the program of his campaign, go no further than the demands raised by the significant social struggles of the last several years: the Occupy movement and the environmental movement, especially. The lesson for activists working for Sanders is quite clear: Do better work and be more effective by building social protest movements at the grassroots and national levels. The opportunities are many and varied. The Ferguson National Response Network is a good source of information for protest actions taking place in cities all across the United States. The approximately 100 organizations that attended the United National Antiwar Coalition conference would eagerly welcome new supporters. Whether it is 15 Now, Black Lives Matter, local campaigns against nuclear power plants, struggles for environmental issues, women’s rights, and more, important causes need the time, energy, and money that is being poured into the Sanders for President Campaign. The biggest flaw with Bernie Sanders is not his failure to condemn capitalism as a system and call for its overturn. It may even be asking too much to expect Sanders to fight for the structural reform of capitalism, to demand the nationalization of basic industries, as the British Labor Party did after World War II, in a platform that won a national election. The Sanders team will say the times are not right for such bold measures, that it is enough if Bernie only wants to soften some of the system’s worst excesses. But the time has come—in fact, the time is long overdue—to show a new generation of activists just what the Democratic Party is and why it is necessary to move past it. Bernie Sanders fails to take that decisive step. His campaign by its very nature misleads activists by asserting that the Democratic Party is a fit instrument for the kind of social change that is needed to transform America. A socialist who truly merits the term “independent” once said, “Capitalism rules and exploits the working people through its control of the government. … And capitalism controls the government through the medium of its class political parties. … The unconditional break away from capitalist politics and capitalist parties is the first act of socialist consciousness, and the first test of socialist seriousness and sincerity” (James P. Cannon, “Speeches for Socialism,” pp. 339-340, emphasis added). Sanders has been compared to a “sheep-dog” who herds people into the Democratic Party. A better analogy might be drawn from the world of sports. In the preparation for a championship bout, boxers hire sparring partners to help them train and get into shape for the real match. That opponent is there to fight but not fight too much. Though putting on a lively show before losing, the sparring partner should not cause the real boxer any serious injury, much less draw blood. This type of dynamic is underway now in the Democratic Party primaries. Bernie Sanders is primarily a sparring partner for Hillary Clinton. March on Washington for Medicare for all!